The WestCOG Region’s major tick borne illness, Lyme Disease, was first recognized as a distinct clinical entity from a group of arthritis patients in the area of Lyme, Connecticut in 1975. This disease also had an extensive history in Europe throughout the twentieth century. As of 7/1/2016 the tick illness prevention effort became fully regional, for all 18 towns. WestCOG is funding the Ridgefield Health Department $20,000 annually to provide educational services for the full WestCOG area. 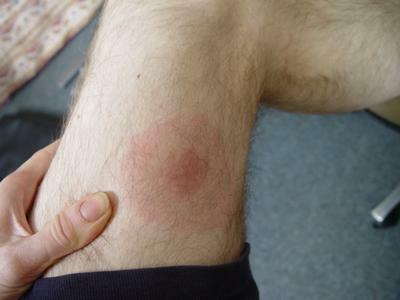 Lyme Disease is caused by bacteria transmitted to humans by the bite of infected blacklegged ticks. Typical symptoms include fever, headache, fatigue and a characteristic skin rash. If left untreated, the infection can spread to the joints, heart and nervous system. During 2008 Ridgefield received a grant from the CT Department of Public Health for a program of Lyme Disease prevention and education. The resulting BLAST Program, led by Jennifer Reid, was designed to be shared with other communities. “B” stands for bathing soon after spending time outdoors. A recent study showed that people who did not contract Lyme disease were more likely to shower or bathe within two hours after spending time in their yards. 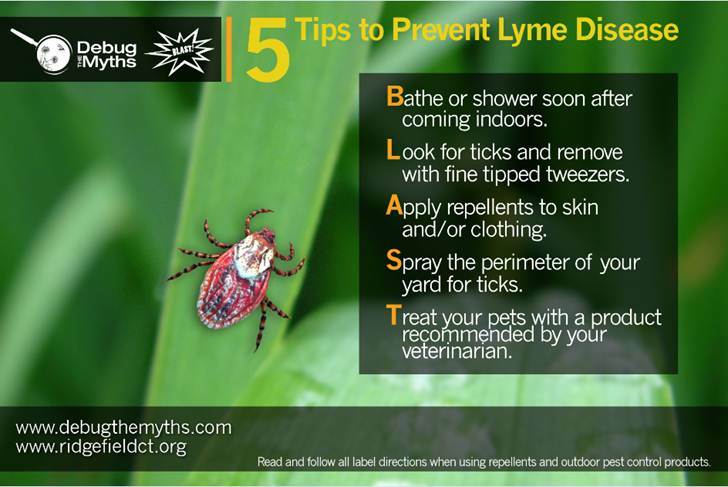 “L” reminds everyone to look their bodies over for ticks daily and remove them properly. Speedy removal helps avoid disease transmission. Remove ticks carefully by their mouthparts with tweezers and save them in a plastic bag for identification. Contact your local health department for tick-testing policies and notify your physician if you have any concerns. Expanding rashes should be reported to your physician in a timely manner. The painless erythema migrans (EM) rash can often go unnoticed and will eventually disappear while the infection remains. Other early symptoms include fatigue, headache, fever and achy muscles and joints. “A” encourages you to become educated about repellents and apply them appropriately. Studies have shown that applying 30-40% DEET-based repellant to skin is effective at repelling blacklegged (deer) ticks. Application of 0.5% permethrin-based insecticide to clothing is highly effective at repelling ticks. Clothing treated with permethrin can be washed several times and still retains its repellant properties. “S” stands for spraying the yard to reduce tick abundance. Homeowners should consider the benefits of applying pesticide to the perimeter of their yards. Studies have shown that even one application of pesticide at the right time of year and in the best location can reduce blacklegged tick populations by 85 – 90%. Complete information on tick management is available in electronic format through the Connecticut Agricultural Experiment Station’s CT 2007 Tick Management Handbook. “T” reminds everyone to treat your pets. Local veterinarians offer a variety of methods for protecting animals from tick-borne diseases. Dogs and cats increase one’s chances of exposure to Lyme disease. 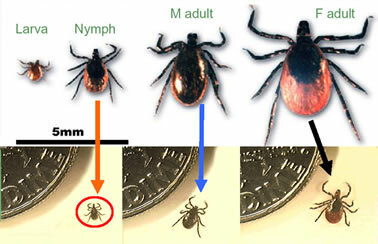 Pets can carry ticks in to the home on their fur. Pet owners should be cautious about sleeping with their pets. Make everyone in your family a Lyme fighter this year.